Conan the Barbarian is the movie that made Schwarzenegger a star, and it's easy to see why, thanks to lavish production and an epic story. Whether you take the film seriously, or look upon it as an exercise in kitsch is up to you. Either way, Conan works, delivering meaty entertainment by way of violence, muscles, hot babes, more muscles and even more violence. Thankfully, the film is peppered with some real acting talent to offset the crude efforts of Arnie and his fellow muscle-bound "actors". James Earl Jones plays the baddie of the piece, and a fine performance it is too. Praise also to Max von Sydow, even if his role is lamentably minor. In fact, it is the true thesps that get the majority of the dialogue, when there is some that is, as whole chunks of Conan are sans speech. During such a hiatus in chat, the stirring, operatic score by Basil Poledouris steps in with its own distinct voice. Those used to the likes of John Williams may take a little while to adjust to Poledouris' work, as it is very unlike a regular movie score. However, without it, Conan would have been a lesser film. As this is a special edition DVD, the extras are abundant, including a specially made documentary featuring retrospective interviews with the principals, including Arnie. The extras are well presented and informative, and certainly do justice to the material. Sadly, this release of the film suffers from one major problem. The disc containing the movie itself also contains a number of trailers for other films. These play (although they can be skipped) before you reach the menu. In a special edition DVD release this is UNFORGIVEABLE. Collectors are not interested in trailers for other films. Collectors are interested in the best possible sound and picture. Trailers take up space on the disc, so the compression ratio for the feature is higher than it would be than if the trailers were not present. This means a reduction in picture quality. 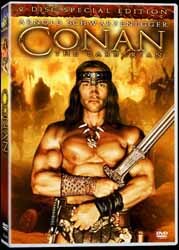 For this reason, Conan the Barbarian: Special Edition loses two marks.